Package Deal! Stocky's® Long Range Composite Premium Finished Stock with Wyatt's M4 Det-Mag! Stocky's is now offering Package Deals! We're making it even easier to upgrade your rifle in one step. This package deal includes a Stocky's® Long Range Composite stock in Long or Short Action, Sporter or Varmint Barrel in a variety of finishes and your choice of a Wyatt's M4 Detachable Box Magazine Assembly. Stocky's® Long Range Composite Stock for Remington 700 Long or Short Action, Varmint or Sporter Barrel in your choice of finish. The new Long Range Composite Stock is is the result of two years of research and development that was designed to accomplish several goals. First, we wanted to combine the best modern stock designs in the world into one “ultimate” model that would not only have the most inherent accuracy available, but also have the high comb needed to clear big scopes while still able to remove the bolt from the receiver. We also required the LRC™ to be durable, comfortable to shoot, easy to control and flexible enough to accommodate a wide range of barrels from hunting-weight sporters through the heaviest varminters. We accomplish this barrel interchangeability though the use of our patented forend inserts (pictured below # 2.2, 2.3). The stock may be used with either the narrow or wide insert, or without the insert at all. Although they do add stiffness to the forend when installed, the forend is plenty stiff without it. Therefore little outside of cosmetics and some dust proofing is accomplished by their use in this particular model. Your preference will be the guide here, bear in mind the more free float the faster your barrel will cool. The composite material we use can easily be sanded, machined, modified and finished just like any composite stock. We will be offering them not only in the base composite material as shown here, but have spent a great of deal of development effort into new baked-on finishing technology that we will soon offer in a variety of solid colors as well as camo and other patterns. We have a new textured black finish online now. length overall - 32"; forend width - 2"; weight 3.5 lbs. Wyatt's Det Mag M4 Offered in 5 or 10 round assembly. Single stack (vertical cartridge feeding) for smoother, more reliable follow up shots. 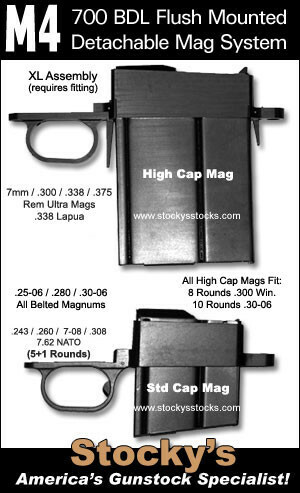 That is why the 5 round is taller than the staggered design of the Remington factory DM. This could be a drawback carrying a hunting rifle but is a big advantage for reliability. Also, check your local laws for any magazine capacity limits on BOLT ACTION hunting rifles. Some states limit capacity for hunting on semi-autos but not bolt guns, others may limit both so be sure to check.